All sheds come with a floor built into the structure. Floors are constructed with 4″x6″ skids notched 1″ with 2″x4″ or 2″x6″ floor joists 16″ on center. The floors are then decked with 5/8″ treated plywood. Each seam on the floor has a wood block underneath it. The heavy duty floor (which is standard on garages) have floor joists 12″ on center with 3/4″ treated plywood. We have one of the strongest floors in the industry and our floors should never rot out! LP® ProStruct® Floor with SmartFinish®* offers an attractive overlay for a beautiful, professional-grade appearance on sheds and other outdoor structures. With no knots or voids, it’s a welcome change from traditional plywood flooring. 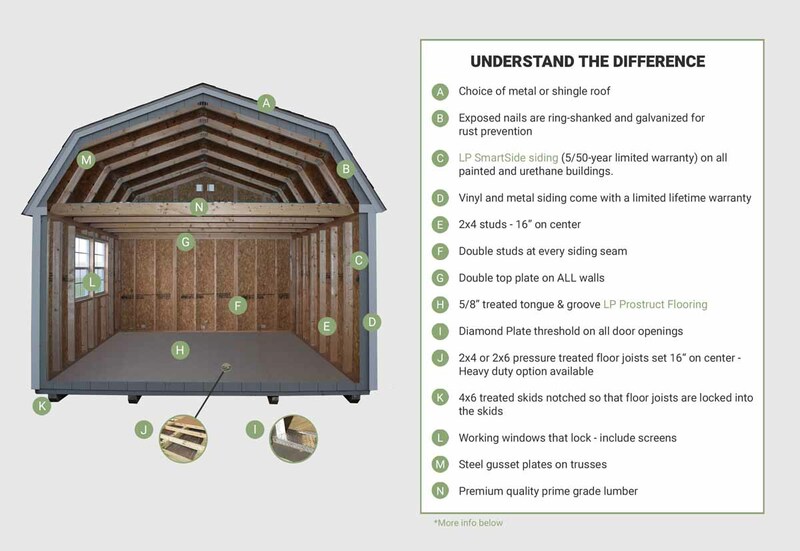 Unlike plywood shed floors, LP ProStruct Floors with SmartFinish are treated with the SmartGuard® process for longer-lasting performance in tough climates. 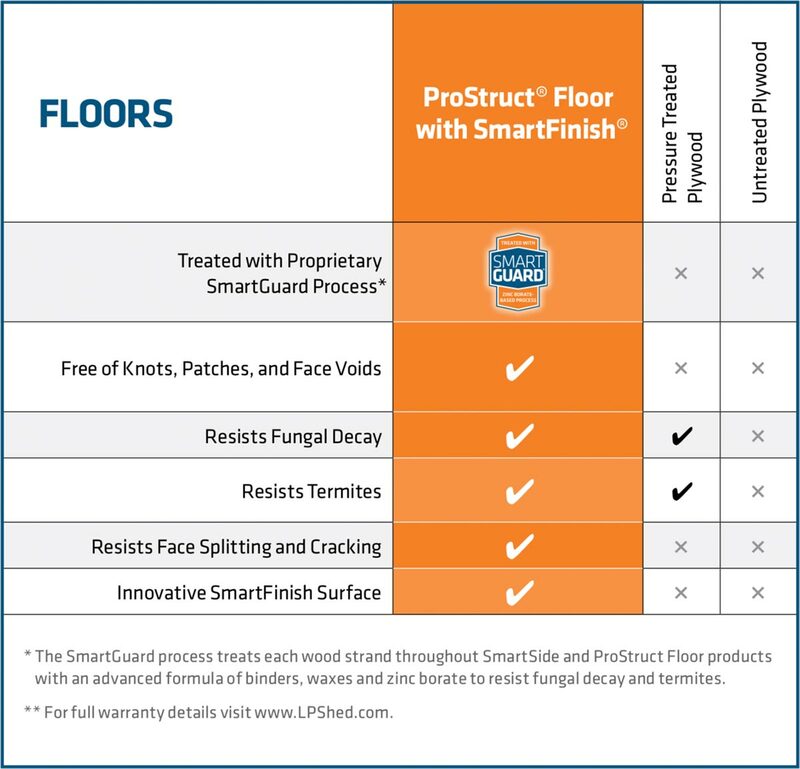 *LP ProStruct Floor with SmartFinish is for non-residential use only. ** See LPShed.com for complete warranty details. Framing consists of 2″x4″ studs every 16″ on center. Buildings with treated T1-11 siding have studs every 24″ on center. We also place a double stud every 4′ where the siding splices. Cabins, vinyl siding option, urethane SmartSide and painted SmartSide option all have studs every 16″ on center. All walls are built with double top plates! It’s Simply A Better Choice For Your Outdoor Building! 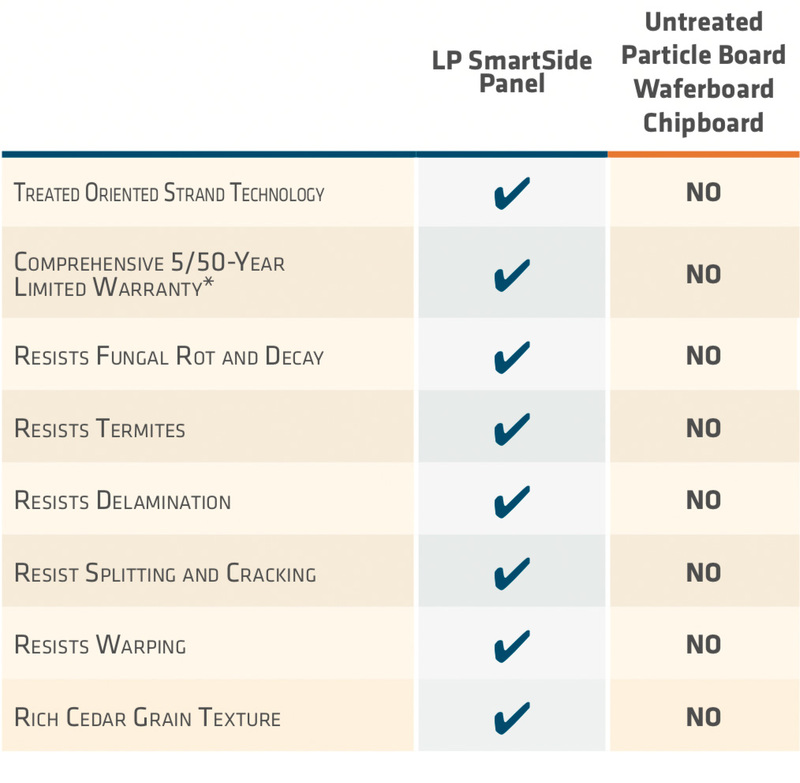 LP® SmartSide® products are not made of wafer, chip or particle board. In fact, our engineered wood products are made with our Treated Wood Strand Technology so you can rest assured your structure will provide years of beautiful service! All LP SmartSide products are treated with our proprietary SmartGuard® process to resist fungal decay and termites in harsh environments. Tested in Hilo, Hawaii, LP SmartSide products continue to resist structural damage, even after years of exposure to thriving termite colonies and excessive moisture! It takes only one look to notice the rich cedar grain texture and undeniable beauty of LP SmartSide products when compared to typical pine siding. It’s a premium choice that gives your outdoor structure an attractive custom-built look! All LP SmartSide products feature a 5/50 year limited warranty, one of the best warranties in the industry. You can feel confident that you have made a better choice for lasting durability and beauty. *See LPShed.com for complete warranty details. All lofted buildings have two loft areas; one on each end of the building with an open access area between the two lofts. Lofts are built with 2″x4″ or 2″x6″ loft joists and sheathed on top to make a nice loft floor. Each building has 24″ on center trusses made of 2×4″ material. The trusses are pressed together with truss plates and a hydraulic press. On the top of the trusses the roof is strengthened up with OSB. All buildings are topped off with a 40 year 29 gauge metal roofing or manufacturer lifetime warranty architectural shingles with a 130 mph wind rating. Most sheds come standard with the double 3′ doors which have 70″ clearance on the width and 71″ on height. The diamond plate aluminum threshold is standard on every building – another standard feature which plays a part in our robust storage shed construction. Our portable buildings are made with Amish-Mennonite craftsmanship that will withstand the harsh Midwestern weather and serve your storage needs for years to come.